For over 80 years these logs have been the best choice for radiant wood heat. North Idaho Energy Logs are produced by machines that have been recycling wood waste since the 1930’s. Energy Logs are made entirely of wood by-products from sawmills, and are a much cleaner burning fuel than traditional firewood. The high density and low moisture content of our 8lb Energy Log enables it to pack 8600 BTU’s per pound. With our manufacturing process our logs burn hotter and longer than firewood or other manufactured logs. One Of the Cleanest, Greenest and most Cost Efficient fuels on the Market. North Idaho Energy Logs have been tested extensively against other manufactured wood heating logs. The 8lb Energy Log can not be compared one on one with the competition since other logs are lighter, at 2-6 lbs. Our tests have been done by weight. Pound for pound, the Energy Log burned twice as long as other manufactured logs. 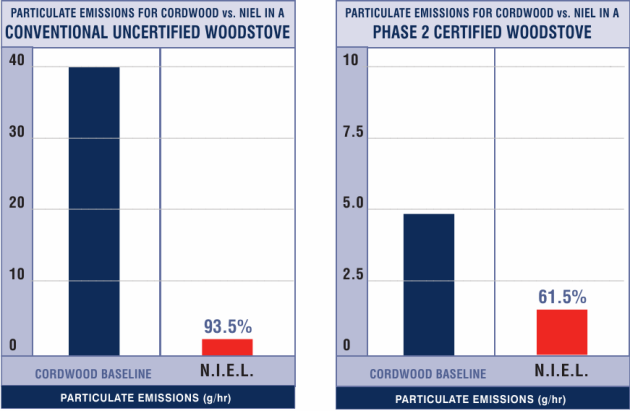 The log comparison tests were done in both a conventional uncertified wood stove and a phase 2 certified wood stove. Energy Logs consistently outperformed other manufactured logs. The high density and low moisture content of the Energy Log enabled it to pack 8,600 BTU’s per pound. Amazingly, one 8 lb Energy Log has approx. 68,000 BTU’s. Energy Logs are a compact bundle of energy just waiting to happen! Pound for pound it’s awful hard to beat the price and efficiency of Energy Logs. Energy Logs must be stored in a dry place. A low moisture content s an important factor in the efficiency of Energy Logs. To help assure lasting log quality during storage, take measures to protect the Energy Logs from environmental moisture. 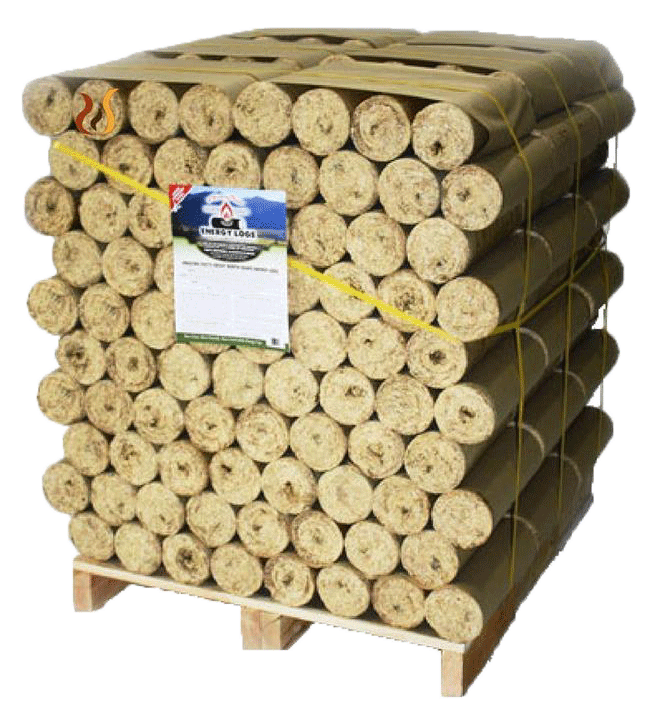 1 Pallet of ENERGY LOGS Has The Heating Capacity of 1.5-2 CORDS FIREWOOD. Energy Logs contain approximately 68,000 BTU’s per log. Energy Logs weigh approximately 8 lbs, measure 13 inches long and 4 inches in diameter. Energy Logs create less ash and little or no residue. 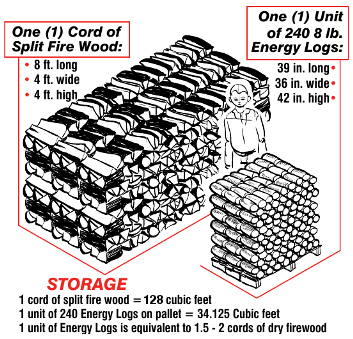 Energy Logs burn hotter and longer than firewood and other manufactured logs. It takes a very little number of energy logs to provide you with the warmth of wood heat. We suggest burning NO MORE THAN TWO (2) ENERGY LOGS AT A TIME, unless starting with a cold firebox as suggested in the Lighting Instructions. DO NOT OVERFILL YOUR STOVE OR FIREPLACE.